Trail Highlights : Although snowmobiles use the historic Homestake Road, this route offers excellent snow tours because of its easy grade and freedom from avalanche danger, except at the very end near the dam. 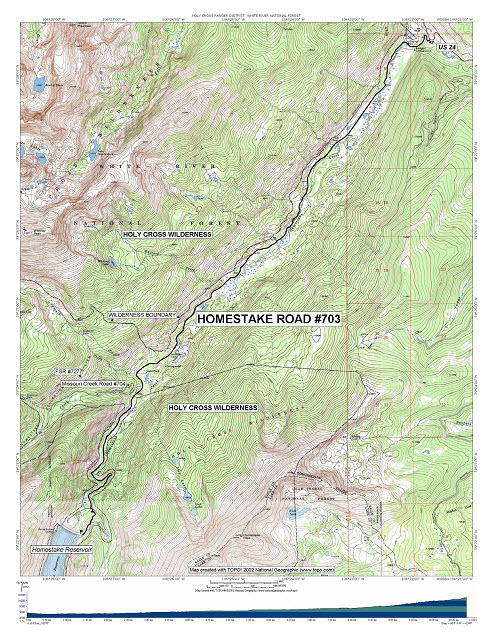 Homestake is a wide, glacial-formed valley with a gentle slope that is great elk winter range. The road follows the Homestake Creek for 10.82 miles and offers plenty of shorter destinations along the route that will satisfy snowshoers and skiers. Access from Vail : Travel west on I-70 to Exit 171 for Minturn, Leadville, and Hwy 24. Exit here and turn right (south) onto Hwy 24. Proceed south about 13 miles to the Homestake Road (#703) pullout on the right. History of the Homestake Valley : The Homestake Road once served as an 1880s stagecoach route to the gold towns of Gold Park and Holy Cross City and a link to neighboring Missouri Camp and Camp Fancy. The stagecoach brought travelers from the Denver and Rio Grande Railway station at bustling Red Cliff to these remote towns. Prospectors organized the Holy Cross Mining District in 1880. It expanded to an impressive 100 square miles during the 1880s boom years.